3.2 Hole in Tail Section? About 150 bodies, including burnt corpses, were found in a 5 km radius from the crashed aircraft, the sources said. The plane fell vertically, which led to large parts of it burning, the sources added. FlightRadar24: More data from flight #7K9268 shows very big changes in vertical speed last 20 seconds. (Also stalling -horizontal speed became too low). It was initially reported that pilot reported some problems with radio transmission, asked to land at the nearest airport. Subsequently, Egypt denied that emergency landing was requested, saying that normal radio contact was maintained until plane disappeared from radars (TASS quoting Egypt civilian aviation minister Husam Khamal). Early media reports claim that some engine problems were reported earlier in the week. Egyptian TV uses photos from a 2014 crash in Algeria. Illustrated in BBC-article. (Tail section is apparently among debris which broke up first, according to media reports; not clearly shown on maps so far). The nose section is intact. Cockpit roof is crushed, cockpit came down upside down. The tail section came down intact in upright position. Flight data (above) suggests that pilot struggled to ascend (not clear exactly why), but the plane stalled and went down into a spin. That could eventually rip off the tail section. But an explosion on board is not excluded as well. So far, some contradictory and confusing information. An investigation will be conducted, and Airbus representatives went to the scene. Wreckage and black boxes are recovered. So we will know, in the end. An investigation area is currently 16 square kilometers, suggesting that the plane broke up before hitting the ground. This official incident description is said to involve the same plane. Indeed, past registration record confirms that this is the same plane. Employees of the investigative bodies and special services, conducting an investigation into the causes of the crash Airbus 321 on the Sinai Peninsula, found in the wreckage of one of the tail section of the liner a strange ragged hole. According to preliminary data, it is from this point, located directly under the keel (part of the tail ), could begin the destruction of the whole body of the plane. (Rudder failures resulted in some crashes (2001) and some survivals (2005). If rudder fully turns in error, it will give a yaw and roll, which may send a plane into a dive. In 2005, pilot was able to correct this by other controls). It is said (Kommersant.ru quoting its 'close to investigation sources') that data recorder did not provide clues. It was in the tail. Showed normal work; than all data stopped, apparently because the tail separated. Voice recorder was damaged and was not read yet. There is one other recording device, for daily updates on system and crew performance; it was in the cabin and not protected or fireproofed; apparently destroyed in the crash. Different version of data recorder information appeared earlier, quoting Egyptian sources-engine explosion was blamed. 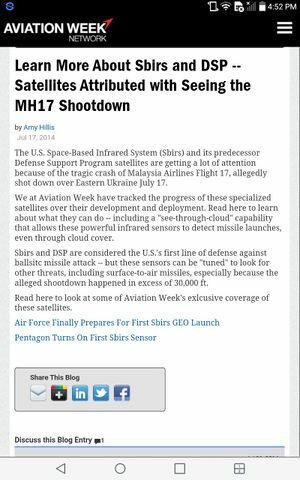 "Satellite detected heat flash at time Russian jetliner went down", CBS, 2.11.2015. 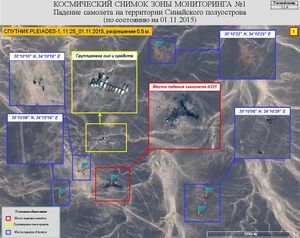 CBS News' national security correspondent David Martin reports a U.S. infrared satellite detected a heat flash over the Sinai at the time the Russian plane went down. The data is still being analyzed in an effort to determine what caused the flash. One possibility is a bomb, but an explosion in a fuel tank or engine as the result of a mechanical failure is also possible. It is said that injuries of passengers in front and back are different, blunt trauma, broken bones and blood loss in front; explosion-type injuries and severe burns towards the tail, according to lifenews. Reliability of this report is unknown, no official release so far. Experts have found in the area of disaster elements not related to the aircraft structure," - a spokesman said. "They were sent for examination," - said one of the sources. Official confirmation of this information is not available to TASS. TASS quoting Reuters, al Masri al Yaum, Egiptian investigators: powerful explosion (caused by bomb or fuel explosion) in an engine, simultaneous failure of both engines, fire in parts of the body, disintegration of the plane in the air and quick fall. During preliminary search, explosive traces were not found. Sand is searched to determine whether it was a bomb, according to Reuters. 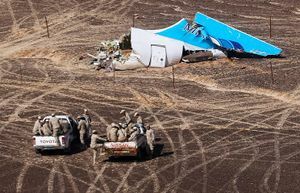 CNN: "U.S. intelligence: Bomb likely brought down plane"
British and U.S. officials said Wednesday they have information suggesting the Russian jetliner that crashed in the Egyptian desert may have been brought down by a bomb. Intercepted communications played a role in the tentative conclusion that the Islamic State group's Sinai affiliate planted an explosive device on the plane, said a U.S. official briefed on the matter. The official added that intelligence analysts don't believe the operation was ordered by Islamic State leaders in Raqqa, Syria. Rather, they believe that if it was a bomb, it was planned and executed by the Islamic State's affiliate in the Sinai, which operates autonomously. Two U.S. officials told the AP on Tuesday that U.S. satellite imagery detected heat around the jet just before it went down. The infrared activity could mean many things, including a bomb blast or an engine on the plane exploding due to a malfunction. One of the officials who spoke condition of anonymity because they weren't authorized to discuss the information publicly said a missile striking the jetliner was ruled out, because neither a missile launch nor an engine burn had been detected. Info France 2; google translation. While it is possible that Russia needs the F.B.I.’s experience to help solve the mystery of the crash, the Kremlin may have seen the cooperation as another opportunity to be engaged as a partner. Looks like they can use some help as it seems they are not finding definite forensic clues one way or another fairly quickly; this may speed up investigation. Not seen so far in Russian press, it is Egyptian investigation welcoming help rather. 10.11 'FBI offer of assistance in Egypt crash probe goes unanswered': (unidentified) "U.S. government source" Reuters. (Peskov declined to comment on this or similar reports). Video of a meeting in Kremlin on investigation results, and the consequences. 31 Oct. 2016. Explosive decompression confirmed -TASS . Conflict News: BREAKING: Islamic State group in Egypt claims it downed Russian airliner. A grainy mobile phone video circulated online purports to shows the moment the airliner exploded before hurtling down to earth, but its origins are unclear and it could not be verified as authentic. However, it appeared to chime with accounts from eyewitnesses who said the plane fell flaming from the sky. Yves Trotignon, a former French intelligence agent, noted that ISIS's claim of responsibility was vague in detail. "The statement does not say they shot it down, but that they destroyed it," he told Le Parisien. "You could imagine explosives on board, or sabotage." On 5.11.2015, British PM called Putin, explaining UK decision to suspend flights to Egypt. On 6.11, Russian FSB chief Bortnikov recommends to suspend flights to Egypt until causes of the crash are determined. Putin approved. Peskov stated that this does not mean that terrorism is determined as the cause of the crash. US officials have told NBC News that the Pentagon intercepted "detailed chatter" shortly after the crash of the Metrojet A321. That communications was allegedly sent between IS affiliates in Sinai and the group's self-proclaimed capital in Raqqa. According to unnamed officials, the communications allegedly included boasts of taking down the airliner. "They were clearly celebrating," the officials told NBC. The officials say that additional communications intercepted before the crash warned of "something big in the area." Two different versions of the video exist, each seems to show a different crop of the same original. Cropped upright version with only the central part of the video shown. Starts with a banner trailer of the Islamic State Province of Sinai. The Wadi Press YouTube account has been deleted, copy saved here. GCHQ, the Government’s secret listening centre, picked up “chatter” from extremist groups in Egypt immediately after the Russian plane came down. The regional accents suggest “a definite and strong link” between British extremists and the attack, according to intelligence sources. “Jihadis in the Sinai area of Egypt could be heard celebrating,” one source said yesterday. “A closer analysis of that material has identified London and Birmingham accents among those numerous voices. “There has also been some internet traffic suggesting that there was British involvement in the attack. This was a very sophisticated, carefully planned operation involving many moving parts. “We know there are British jihadis in Egypt fighting with members of Islamic State. They were trained in Syria and are now hardened terrorists. Some of the Britons have an electronics background and have been developing some very sophisticated bombs. Egypt Air mechanic who is cousin to Isis fighter 'among 4 arrested' over Russian plane bombing, International Business Times, 29 Jan. 2016. The state media controlled by Messrs. Putin and Sissi have a nasty habit of blaming all disasters on the United States, no matter how far-fetched the theory required. 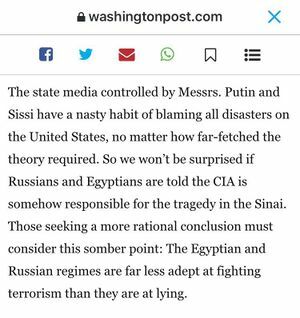 So we won’t be surprised if Russians and Egyptians are told the CIA is somehow responsible for the tragedy in the Sinai. Valentin Vasilescu demonstrates here the impossibility of the theory of a bomb placed in the plane. After having explored all hypotheses, there is now only one left – that of a failure in the software of the automatic pilot. We may therefore conclude that the accusations of the United Kingdom and the United States, as well as the claim for responsibility by the Islamic Emirate, are propaganda. The crash was not a terrorist attack. But the problems in the automatic pilot system may be either an accident or the effect of sabotage by an extremely specialised secret service. Some unknowns here, wild vertical moves on flightradar --but said to be steady autopilot climb on data recorder. Chemistry issues: in-field equipment tests for known, common residues. Apart from common explosives, the author lists nitrates (oxidizer), peroxyde (oxidizer), chlorine, bromine (oxidizers) . Those are not even all common oxidizers, and does not tell about uncommon. This page was last edited on 31 October 2016, at 14:55.